Spacious grass pitches on a peaceful well maintained site, with great sunsets. 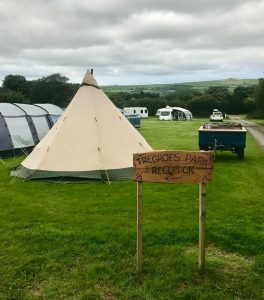 Tregroes is a small, family friendly site, situated in the tranquil Pembrokeshire countryside. We have 30 grass pitches suitable for tents, campervans, caravans and motorhomes. Fishguard, with its pubs, shops and restaurants is an easy 20 minute walk. The spectacular coastal path is just a mile and a half away. 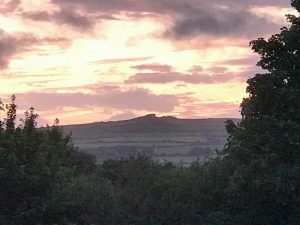 You can walk north along the path to Newport or west to Strumble Head or use the Strumble Shuttle if you want to leave the car and travel further afield whilst still using Tregroes as a central base. We are a favourite stop off for persons visiting or returning from Ireland with Stena Line Ferries- we therefore allow travellers to check in after the evening ferry. The shower and WC facilities are positioned in a central communal block. There are no charges for our hot showers, all are included in the price you pay. A covered dish washing facility with hot and cold water is provided in the communal area alongside toilet block. We even provide washing up liquid. Camp fires are permitted in purpose designed fire pits which are available to hire on site. Seasonal pitches and storage is also available – please contact us for further information.